Great news! My new book on parenting teens is here! 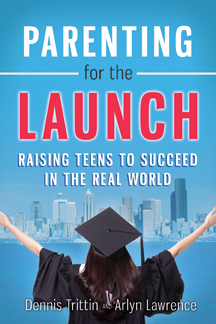 Co-authored by What I Wish I Knew at 18 author Dennis Trittin and myself, Parenting for the Launch: Raising Teens to Succeed in the Real World is now available for you to order, just in time for Christmas. We never envisioned writing a parenting book when we began collaborating on What I Wish I Knew at 18. But, through our work with educators, counselors, business leaders, employers, and families, we regularly hear feedback about the training today’s kids are not getting, and what’s needed—from the perspectives of those receiving the kids we are raising – i.e., employers, schools, colleges, and youth organizations. It’s our joy and privilege to serve other parents, who, like us, want to set their children up for every success in life. And, it’s an honor to help educators build stronger bridges with parents. We hope you enjoy the book, spread the word to others, and join us on our journey at www.parentingforthelaunch.com! Superb, what a website it is! This website provides useful data to us, keep it up.